One of the missing links in the iPad photography workflow has been the ability to add copyright and other IPTC data to your images before sending them along via the Internet. Now, thanks to a new app by Cyril Godefroy called Meta Editor, you can add tags, author name, copyright, captions, and even geodata to any image that resides on your iPad. I've add this application to my existing iPad workflow that uses an Eye-Fi card and ShutterSnitch to wirelessly move the images from my Canon PowerShot S90 to the iPad. I will sometimes touch them up using Photogene. And if I'm going to share them online, I open the shots in Meta Editor to add my IPTC data. 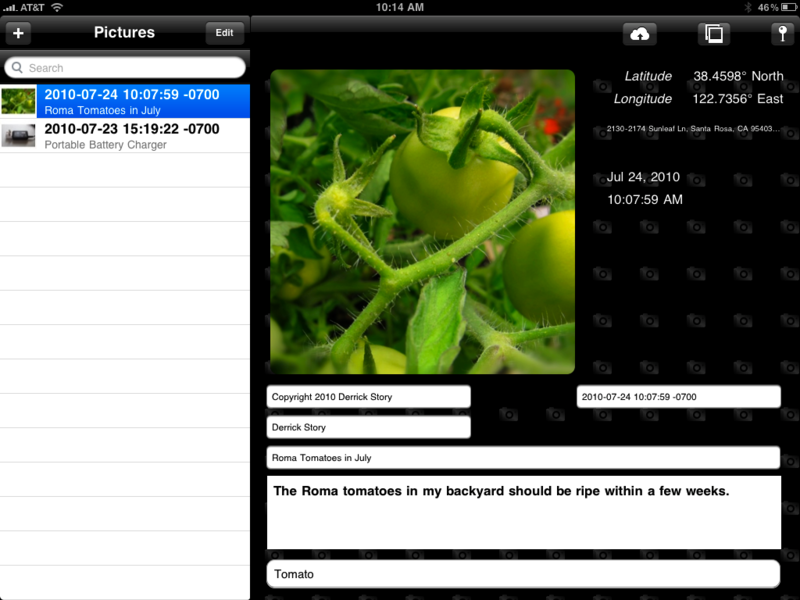 In the screenshot above, you can see the Meta Editor interface and the information I added to the Roma Tomato shot. Then, in the screenshot below, you see the same data in the Information dialog box for Preview on the Mac. All the data traveled with the image. And if you take a look at the Flickr version that was uploaded directly from the iPad, you'll see that "Tomato" was added as a Flickr tag too. Very nice! Meta Editor is available in the App Store for $9.99. It still has a few rough edges that I'm sure will be smoothed out soon by the developer. But in the meantime, it does work well, and I haven't found anything else like it for the iPad. I recommend Meta Editor to iPad toting photographers who need to add IPTC data to their images. 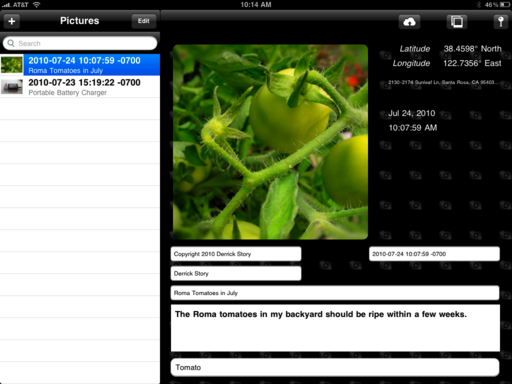 I need THIS App for Iphone, there is no APP for take IPTC Meta into Pictures. I use the same way like you, Eyefi Card and ShutterSnitch to put the pics to my Iphone, but there is no way to put IPTC Data to the pictures. Please make a APP for Iphone, i think all the Photographers will love it !!! Any new developments in this arena? I would dearly love to travel with only my iPad, import my images while rating, tagging, and otherwise preparing my images for later import into Aperture. I'm not looking for a mini-Aperature but an import pre-processor on the iPad platform. I use my iPad currently and the workflow is tortuous. The MacBook air is looking better with every passing outing. Does anyone know of a solution for me or a project under development? It would be great to have the same application for the iphone. I think there are more users who will appreciate it. did you try the app iMetaPhoto? You can edit IPTC, EXIF,TIFF, GPS-Data and use the app as an alternative foto browser (with basic image processing features).